International Ultrasonic Technologies (IUT) enables fuel oil providers to reduce approximately 98% of the sulphur content with its advanced desulphurization technology. Modular, Efficient, Affordable and Effective. IUT owns 8 U.S. patents related to the use of ultrasonic waves in conjunction with an oxidant and catalyst to desulphurize hydrocarbons. Depending upon the feedstock, IUT’s ultrasonic technology can be used to obtain higher grades of petroleum products at reduced costs. The process can remove sulphur up to 98% from different oil streams. The technology is not only relevant, but our first generation units are commercially ready for the lighter fuel oil market and can be built and installed for small to mid-sized refineries.The results achieved to date have proven our technology to be more efficient, scalable, affordable and effective. Disruptive. Innovative. The IUT advantage. There are numerous sulphur removal technologies available to refineries and petrochemical plants, however, there are challenges with these current technologies which include high capital/operational costs, complex operational requirements, they are less efficient and traditionally have a higher environmental impact. IUT’s technology presents a viable alternative to traditional hydrogenation technologies as it produces a better product in a safer, more efficient and affordable way. Hydrocracking and hydrotreating have been proposed as desulphurization technologies to be applied to produce compliant fuels. However, when applied to heavy oil fractions, high pressures and temperatures and hydrogen consumptions are needed to meet the low sulfur levels required, which makes this alternative economically challenging with substantial investment in upgrading fuel oil residues to gasoil grades needed. To curb this, our technology is currently in the process of being optimized for HFO (marine fuel, MGO). Our research and development team have made several significant strides in the development of our second generation IUT unit(s) in order to meet continuing regulatory demand drivers like ​the 2020 IMO regulations. Our second generation units are currently being developed for land based applications (ex. terminals), with a goal to commercialize these unit(s) by Q2/Q3, 2018. Our company’s vision is to become the leading provider of low sulphur fuel oil desulphurization solutions to industry users. 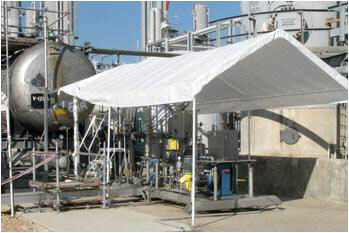 IUT’s Technology has been commercially validated in a US refining facility. All data proved that the technology can successfully remove sulphur content in petroleum streams to less than 10ppm. We’re Here to help your company succeed. Through the most advanced sulphur separation technology available.